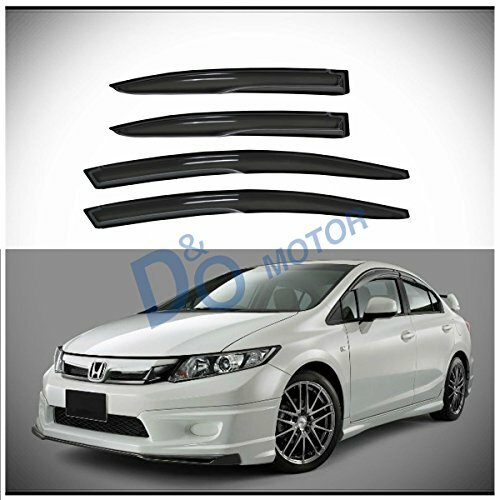 Fitment: 2006-2011 Honda Civic 4-Door Sedan Model Only Position: 2pcs for front doors and 2pcs for rear doors Package Included: 4pcs vent shade window visors (Installation instruction is not included,please check the sample installation picture above for reference) Style: Tape-On Style (Stick on to the door & above the windows.Not In-Channel Style) Material: Reinforced Acrylic Color: Dark Smoke Tint Installation: Direct Tape-On Design,Easy Peel-N-Stick Installation.No Cutting or Drilling Required Item Condition & Features: *100% Brand new in box. * Fully window protected from sun shade, wind, rain, snow deflector. * Help reduce heat buildup in park vehicles by allowing air in when partially open. * Long lasting material designed to withstand the rigors of the elements. * Make it possible to leave the windows down a few inches to get fresh air even on rainy days. * Comes With 3M Automotive-Grade Double-Sided Tapes.Easy Installation. * Dramatically Improve Styling & Appearance. 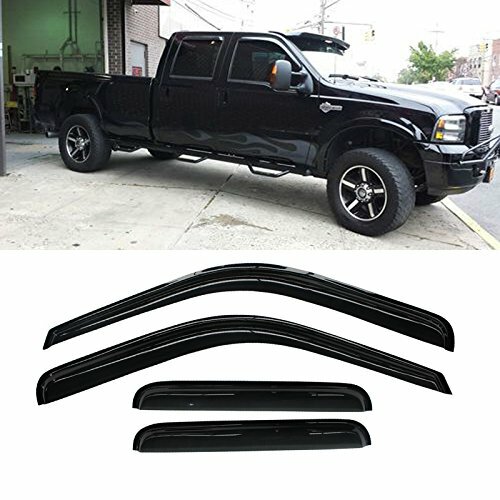 Fitment: 1999-2016 Ford F250/F350/F450 Super Duty SuperCrew/Crew Cab Only (Not Fit Other Cab Models) **Note:Crew Cab model has 2 full size front doors and 2 full size rear doors that open in the same direction.Please check the following picture for more details about the cab difference. Position: 2pcs for front doors and 2pcs for rear doors Package Included: 4pcs vent shade window visors (Installation instruction is not included,please check the sample installation picture above for reference) Style: Tape-On Style (Stick on to the door & above the windows.Not In-Channel Style) Material: Reinforced Acrylic Color: Dark Smoke Tint Installation: Direct Tape-On Design,Easy Peel-N-Stick Installation.No Cutting or Drilling Required Item Condition & Features: *100% Brand new in box. * Fully window protected from sun shade, wind, rain, snow deflector. * Help reduce heat buildup in park vehicles by allowing air in when partially open. * Long lasting material designed to withstand the rigors of the elements. * Make it possible to leave the windows down a few inches to get fresh air even on rainy days. * Comes With 3M Automotive-Grade Double-Sided Tapes.Easy Installation. * Dramatically Improve Styling & Appearance. Features * 100% Brand new in box. 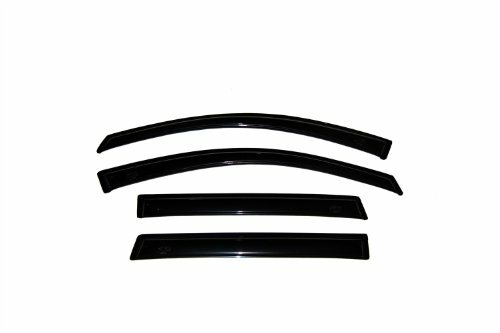 * Latest chrome trim design gives your vehicle a luxury & unique look in the crowd. * Fully window protected from sun shade, wind, rain, snow deflector. * Help reduce heat buildup in park vehicles by allowing air in when partially open. * Long lasting material designed to withstand the rigors of the elements. * Make it possible to leave the windows down a few inches to get fresh air even on rainy days. * Comes With Genuine 3M Automotive-Grade Double-Sided Tapes.Easy Installation. * Dramatically Improve Styling & Appearance. 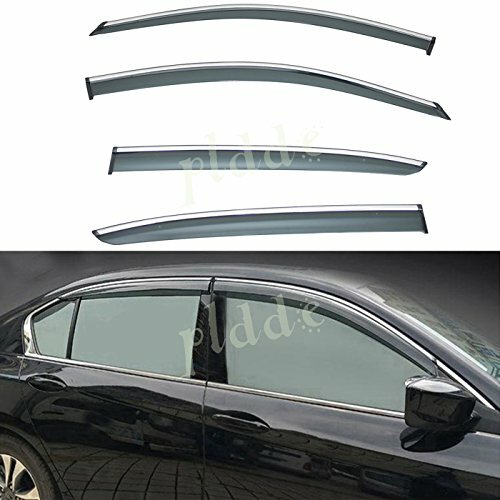 Fitment: 2003-2007 Honda Accord LX/EX/DX Sedan 4-Door Position: 2pcs for front doors and 2pcs for rear doors Package Included: 4pcs vent shade window visors (Installation instruction is not included,please check the sample installation picture above for reference) Style: Tape-On Style (Stick on to the door & above the windows.Not In-Channel Style) Material: Reinforced Acrylic Color: Dark Smoke Tint Installation: Direct Tape-On Design,Easy Peel-N-Stick Installation.No Cutting or Drilling Required Item Condition & Features: * 100% Brand new in box. * Fully window protected from sun shade, wind, rain, snow deflector. * Help reduce heat buildup in park vehicles by allowing air in when partially open. * Long lasting material designed to withstand the rigors of the elements. * Make it possible to leave the windows down a few inches to get fresh air even on rainy days. * Comes With 3M Automotive-Grade Double-Sided Tapes.Easy Installation. * Dramatically Improve Styling & Appearance. 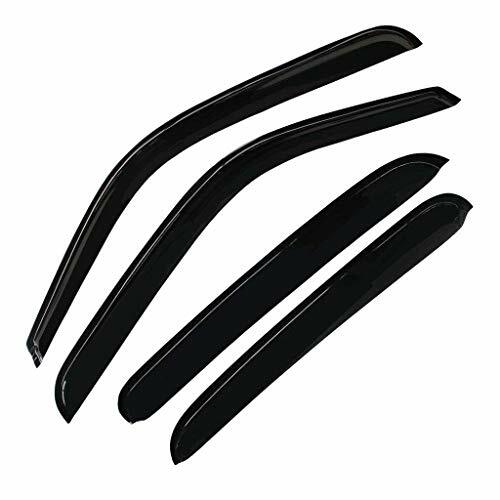 The original VITO Window Visor continues to protect and comfort more drivers on the road than any other window vent. 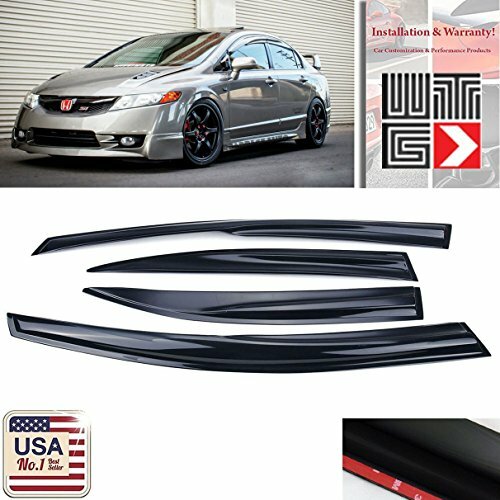 Precision engineered for a perfect fit with every type of vehicle in any type of weather, the original vent visor keeps you dry in the rain and cool in the heat with superior design and style Fitment: 2006-2011 Honda Civic 4 Door Sedan Style:Tape-On Style (Stick on to the door & above the windows. 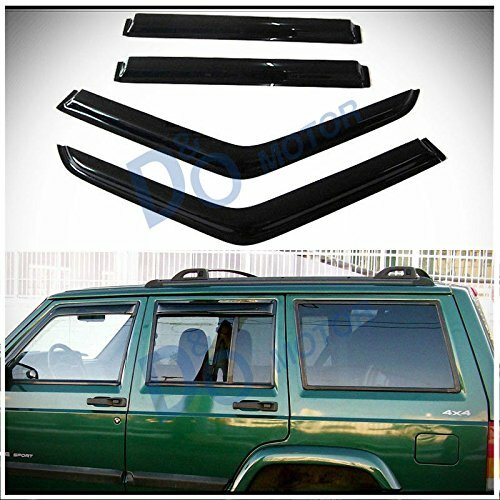 Not In-Channel Style) Position: 2pcs for front doors and 2pcs for rear doors Material: Reinforced Acrylic Color: Dark Smoke Tint Installation: Direct Tape-On Design, Easy Peel-N-Stick Installation. No Cutting or Drilling Required Features * 100% Brand new in box. * Fully window protected from sun shade, wind, rain, snow deflector. * Help reduce heat buildup in park vehicles by allowing air in when partially open. * Long lasting material designed to withstand the rigors of the elements. 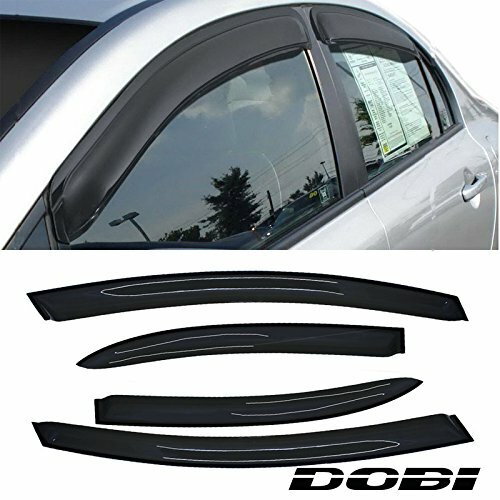 * Make it possible to leave the windows down a few inches to get fresh air even on rainy days. * Comes With 3M Automotive-Grade Double-Sided Tapes. Easy Installation. * Dramatically Improve Styling & Appearance. 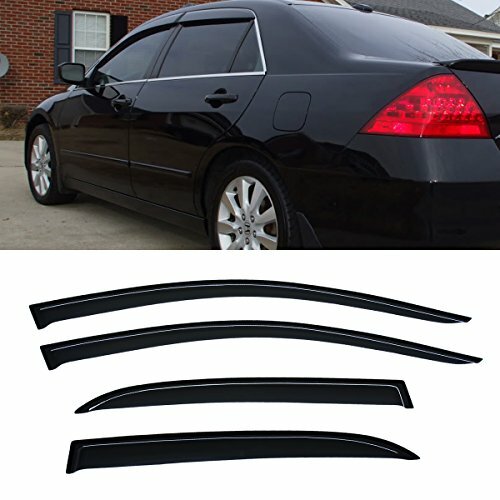 How to mount a rear corner window for a Honda Accord LX, brief overview.